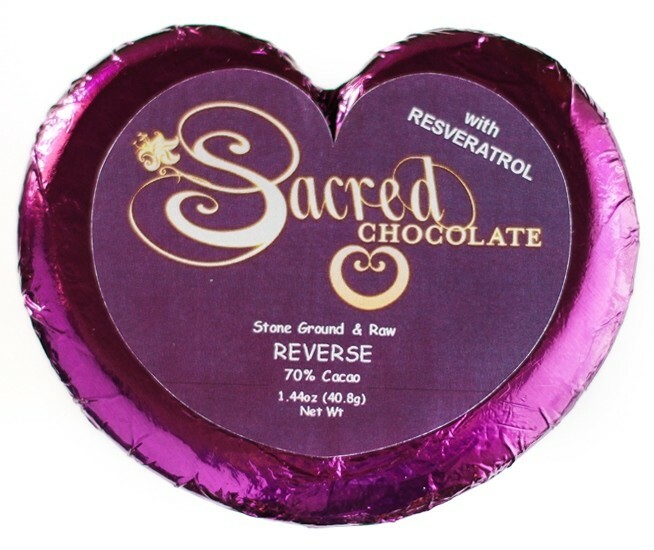 Sacred Chocolate's Reverse heart bar is a true breakthrough in longevity technology. This bar is a red wine infused dark chocolate at a 70% percent cacao content which includes a special resveratrol extract from Japanese knotweed and polyphenols from red grapes. Sacred Heart - The "1.44oz Perfect Golden Spiral Heart" shaped chocolate bar is not only beautiful to behold, but also raises the frequency of the chocolate. Each 1.44 oz. REVERSE chocolate heart contains 9mg of resveratrol and 10mg of grape flavonoids. There is much more resveratrol in this mixture of grape polyphenols and resveratrol than would be present in grapes or wine. This bar has been formulated and fine-tuned so that all the resveratrol and flavonoid compounds are highly absorbable, synergistic, and work with the cacao (chocolate) to deliver superior flavor and nutrition. As a food, this formula has the potential to deliver significantly greater health benefits than pill or liquid formulations of these super-nutrients. In addition, REVERSE also contains an infusion of history’s most celebrated wine: Commandaria from Cyprus (2008 vintage). Despite a trace of wine, each REVERSE chocolate bar is non-alcoholic. Resveratrol is a yellow flavonoid found in grapes, Japanese knotweed, some berries, and there are even traces of resveratrol in cacao beans. Resveratrol is often associated with foods that are dark red or purple. Resveratrol is considered a super-nutrient by anti-aging scientists and researchers. Resveratrol is believed to activate the anti-aging gene: SIRT1 (Sirtuin 1) and help REVERSE the aging process. Resveratrol is believed to be the primary molecule behind the “French Paradox” whereby individuals amongst the French population are known to live about 20 years longer than average by their intake of dark red wine. This chocolate bar has been scientifically designed to: deliver antioxidants that protect cells from free-radical damage, increase longevity by helping to genetically REVERSE the aging process, improve the function of the mitochondria thereby increasing energy, support cardiovascular health, improve androgens and fight bad estrogen by acting as a natural aromatase inhibitor, help the body eradicate carcinogens, inhibit the prostaglandin 2 inflammatory response, switch off the destructive compound nuclear factor kappa beta, and combat metabolic syndrome (in order to normalize fat and carbohydrate metabolism). The Longevity Bliss chocolate bar and REVERSE are also designed to work synergistically together in order to create an youthening effect. We believe these two chocolate bars are the world’s leading anti-aging nutraceutical superfoods. 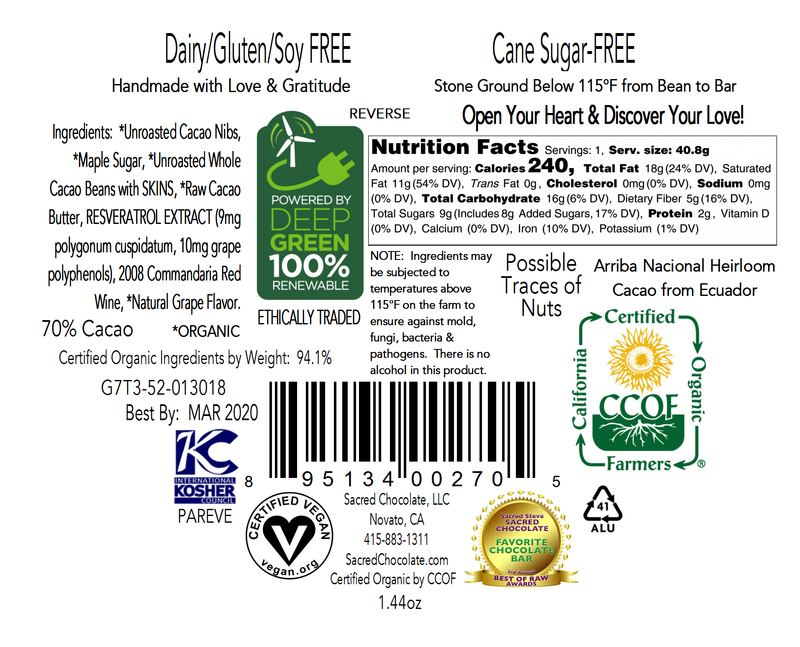 Isn't it against the law to not include the nutritional ingredients on the label in order to sell? I would love to try any of these flavors, but have to turn it down because I can't judge for myself the nutritional content.